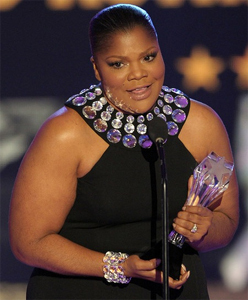 It doesn't look like Mo'Nique was one bit phased by any “alleged” criticism for her not attending the film festivals to help support the movie “Precious” based on the novel “Push,” by Sapphire. She proudly accepted her award for the film's Best Supporting Actress last night at the Critics Choice Awards. “Yes Baby,” says Mo'Nique cheesing into the camera.